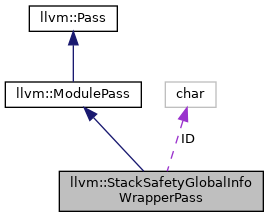 This pass performs the global (interprocedural) stack safety analysis (legacy pass manager). Definition at line 101 of file StackSafetyAnalysis.h. Definition at line 638 of file StackSafetyAnalysis.cpp. getAnalysisUsage - This function should be overriden by passes that need analysis information to do their job. If a pass specifies that it uses a particular analysis result to this function, it can then use the getAnalysis<AnalysisType>() function, below. Definition at line 649 of file StackSafetyAnalysis.cpp. Definition at line 109 of file StackSafetyAnalysis.h. This is called by Analyze to print out the contents of an analysis. Otherwise it is not necessary to implement this method. Beware that the module pointer MAY be null. This automatically forwards to a virtual function that does not provide the Module* in case the analysis doesn't need it it can just be ignored. Definition at line 644 of file StackSafetyAnalysis.cpp. runOnModule - Virtual method overriden by subclasses to process the module being operated on. 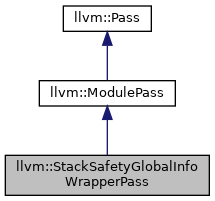 Definition at line 654 of file StackSafetyAnalysis.cpp. Definition at line 105 of file StackSafetyAnalysis.h.